Many people have difficulty receiving the love of God because they never had the love of their earthly father. I (Nadia) for one, I am thankful to have been brought up by a loving father. To all of you fathers out there who are daily loving on your children, keep it up. Your unique way of loving those babies, as insignificant as it may look, has an eternal impact on them. So, we bless you and honour you as you live out your privileged position of imitating the Father’s love to those He has entrusted you with. Receive the strength, courage and grace today to run your race and finish your course with joy in Jesus’s name. Started the year with our usual month of prayer and fasting.January 1st our daughter Elizah was water baptized.In the midst of the month, I was led to do 7 nights of prayer before God.After this the Lord provided us with a new rental place which was much needed. He spoke to a friend to send us a $1000 which covered the down payment and moving expenses. This was a fulfillment of a vision I had had a year before of this same person saying in the vision that she was going to give us a $ 1000. Moved in our new rental which was spacious and met all our needs.Held our first ministry conference ( Go ye… Discipleship conference) which started with all night worship, prayer and ministration on Friday night and had Saturday and Sunday sessions as well.By this time Nadia was about 5 month pregnant and battling low iron levels. In February, the Lord had told us that we needed to have 21 days of consecutive daily prayers. So we started them on March 1st. After this we felt impressed to do another one month of 2 hour daily prayers which we started on April 1st. So much took place in us spiritually that would take a few articles to go in details. Nadia received a letter that finally after 18 long years she was becoming a Canadian Citizen.Started a weekly Bible study for the church we had been attending. Around this time, the Lord started to prepare Nadia about our new mission trip in which this time we were to give away all that we ever owned to follow Him except few things to take in a travel trailer. May 22 2016, Cyrus our 6th child was born naturally and healthy weighing 10lbs, despite Nadia’s low iron levels. June 16 2016, Nadia took the oath of Canadian Citizenship.Nadia recovered well with not much blood loss which had been a threat with low iron. We took a 5 day mini vacation to Oliver, BC where our friends hosted us at their home. Children swam daily in the pool, played bocci and baseball. We had a great time .One day while praying whether we were actually going on a new mission, the Lord ordered me (Pitana) to fast and pray for 3 consecutive days and after that He would answer me and He did and gave me complete assurance that He would take care of us. We gave notice to our landlord and started to give away our belongings and pack what we were to take in the trailer. We prepared and had an Africa night fundraising event in Canada. We also had water baptism service in WA state. On August 30th, the travel trailer was provided. Ministry work in Burns, Oregon with West bank Christian Fellowship. Ministry work again in Oregon house California where we gathered few families and had services for 2 Sundays and when we left, they had plans to continue the church that was started. Ministry at a gas station in Sacramento,CA.Ministry work from house to house in Oakhurst and North fork CA and also ministered at the North Fork Christian Center and led to the Lord an award winning pianist and composer. This month we witnessed a great miracle in our home, our son Jairus suffered a sudden seizure for no real reason and in about 5 minutes, we saw as if he was departing, to him coming back as we prayed but still the left side of his body was not responding and we kept praying and finally he was completely restored to being well. By the time the ambulance came, he was well but thought it good to have him checked and monitored. The hospital kept him for few hours and never did a scan of any part of his body, that’s how great of a miracle the Lord had given us. They were just monitoring the fever and soon sent us back home. Cyrus also was healed of a neck condition he had for several months. Samuel(8) finished reading through the entire Bible for the first time and Jeremiah (11) finished reading through the Bible for the second time. Excited about their rewards. Ministry at Costco in La quinta, CA and more ministry with some friends in Indio, CA. God provided a travel trailer! With all the traveling we do, we had been praying for an RV for 2 yrs. We saw how it would be easier to ‘go wherever the Lord would lead us’ with a home that went with us. So, we prayed and prayed. We fasted and sowed seed believing that God would provide. A week before we would start our journey, there was still no RV. We had said goodbye to our Church and friends, but yet no RV to travel in. Infact, we had let our landlord know that we would move at the end of the month and they had gotten a new tenant. With a week left, we had no one else to turn to but God. He had called us on our next mission trip. He had asked us to give away all of our belongings except what we could take with us in the RV. Now, we were left with no rental place; no furniture; no RV; little to no funds to buy one BUT, we were full of faith. We didn’t know how God would provide but we knew He would. On August 29, with 2 days left before we had to vacate our last place, we heard an instruction from the Lord to let friends know that we were looking to buy an RV if they knew of one. We had spent countless hours searching for RV for sale online but they were all beyond what we could afford. Twice, we had even gathered our children and walked into an RV dealership to look at the ones they were selling. We didn’t have the money, but who is to say that God can’t provide the funds on the way there or while we were there. We knew we had to do our part. We had to believe and faith has works (James 2:18). We traveled to Washington state because we had a baptism service and an African night event.On August 30th, a friend let us know that she had friends who were selling their travel trailer, but it was on the east coast (Niagara falls area). We asked for pictures and soon realized that it was bigger than all the other ones we were seeing in the Vancouver area for that price or more. So, we decided to take it. The owner was selling it for $7500 but he decided to sell it to us for $5000. He is a Christian man. 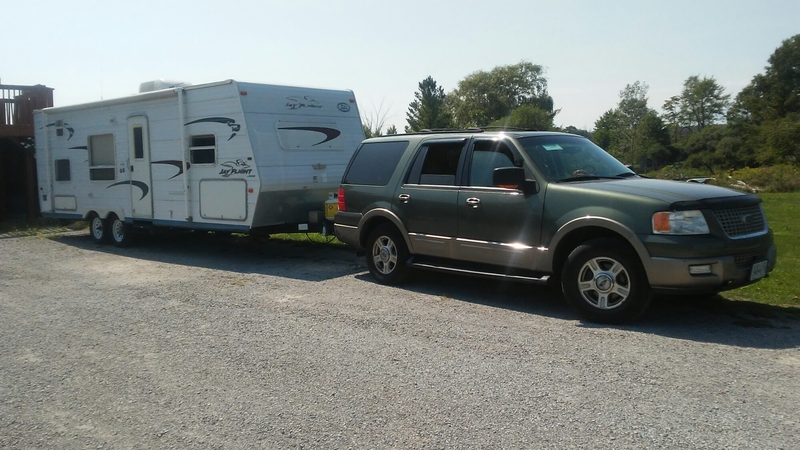 A friend contributed $2000 US toward the trailer and other friends had given about another $1500 CDN .So with about that much money, Pitana embarked on the journey to Eastern Canada to get the trailer. He paid the man $3000 and made arrangements to pay the rest later. On the drive there, knowing that we didn’t have the full $5000, we had felt to pray that the balance would be waived. After doing all the paperwork, Pitana drove back to BC to get us and our belongings and finally begin the next mission. The next morning after Pitana got back, we received a text from the gentleman who had sold us the travel trailer. He wanted to let us know that he had cancelled the remaining amount and that we OWED HIM NOTHING!! Wow! Praise the Lord. We screamed, shouted, jumped and were amazed and overcome by God’s goodness to us. He had finally come through once again. Great is His faithfulness. Hallelujah! Glory be to God! Before, I could start preparing dinner, the children started asking that we BBQ burgers which we didn’t have. We have been meaning to BBQ for a couple months now, but we had not been able to. So, it was decided that we go buy burger patties at Costco. By the time everyone got ready, I knew it would be dark by the time we would get back from shopping. Which meant we would end up buying hot dogs and chicken bake sandwiches at Costco; an extra expense I was not sure we should be paying for. Nevertheless, we agreed to go. On the way there, we felt to pray. We prayed in the Holy Spirit and sang worship songs. As soon as we entered, Pitana excused himself and the children and I headed to the food court. Before long, he came back with a certain gentleman. Within a few minutes, the man was asking us to pray with him. He then pulled out his wallet saying that he wanted to sow into our ministry – $100!! We held hands and prayed with him concerning his situation. We had dinner and did a little bit of grocery shopping, ALL under the funds we had just been blessed with. Plus, he took Pitana outside and went and filled up our gas tank! Glory be to God. He is our Provider and He is good! Now that we are on a slower pace, I can write about some other workings of God on this trip that I was too busy to write about. After we left Washington, we spend a few days in Baker City, Oregon. We then drove to Nampa, Idaho. After we put the children to bed that night, the Lord spoke to us. He said, “I want you to turn back and head back to Oregon!” What? We had just driven from there. Now drive back? The Lord insisted and of course we obeyed. The next morning, we all loaded up and drove back to Oregon, not knowing why we had to go back. When it was time for us to stop driving, we had just pulled in a small town called Burns.We found a campground and set out for the night. It was Saturday night so we inquired at the office about churches nearby. There was a list of churches on a board and one particular one stood out and we felt we were to go to that one. The next morning, we walked into the church building which had a cross on top of it’s steeple. The cross was leaning over about to fall. One of our children was scared it would fall on us as we walked in. We entered and joined the small congregation in worship. There were 3 visiting speakers that day. They are coordinators for Pray Oregon ministry. For the last few years, they had been going around praying over Oregon; city halls etc. As they shared testimonies and their ministry, we couldn’t help but think of how our ministry is bit similar to theirs. They talked about Dutch Sheets and his message “appeal to heaven.” He is a man who God has called as intercessor for America. Surprisingly, Pitana had been listening to Dutch Sheets’message in the car. The same message!! God had really ministered to Pitana in the car! The speakers, in their presentation, they pulled out a flag: the original American flag that says “Appeal to Heaven.” Before the current American flag, this is the one that the founding fathers flew. At the end of the service, the Lord spoke to us and said, “I want you to pray over these speakers.” So we introduced ourselves and began to pray over them as the Holy Spirit led. The congregation joined in. We held hands and prayed and prophecies over them. There were tears, joy etc. Our children were right in the middle of it. Prophecying and praying. Then to our amazement, they handed us the “Appeal to Heaven” flag saying that they felt that we should have it. Wow! There was a gentleman there who in tears said that he had not been to church in 3 months. But that morning although his wife was out of town, he knew he had to come to church. He has a heart for missions in Africa but he had been discouraged. When he saw us, he just wept and wept. God was encouraging him. He had prayed that God would send African missionaries to America! There was lunch after. As we sat down we shared some of God’s wonders we have witnessed in our lives. We then started to pray for people, one after the other as the Holy spirit led us. With word of knowledge, we were able to minister to the church leaders who were just weary and wounded. We encouraged them as God led us. The difference on their faces were remarkable! We were told over and over, ” you have no idea how much we needed this!” We would remind them that God loves them so much that He indeed caused us to turn back and drive back into Oregon, just for them. God is so good. Sometimes in our struggles, it may seem that we are forgotten but our God never leaves us nor forsakes us. If you reading this and feeling forgotten, take heart, God loves you too and He has not forgotten you. One by one, some with tears, those, Precious souls, began to come to us and hand us money. We never mentioned expenses to anyone. But God is good. He knows how to meet our needs. Hours later, when were were leaving the church building, the pastor’s wife handed us the money that they had collected in the service. She also gave us a check. She said that they had given a love gift to their speakers for coming. But the speakers had refused the check asking that it be given to us instead. Wow! This experience so humbled us. We were filled with great joy but also the fear of God. So overjoyed to see God refresh and encourage His people. From the church whose building the cross was nearly falling, the enemy had been trying to crush our precious sisters and brothers. But God… Hallelujah! ” Rejoice not against me o my enemy. When I fall, I shall arise.” Micah 7:8. The fear of God part was thinking of; what if we had not obeyed? It seemed humanly reasonable to disobey. But God’s ways are higher than our ways. More than ever, we want to hear the Lord’s voice and obey immediately so help us God. The bonus? The money we were gifted with covered our expenses for the next 2 weeks!! So, if you are hearing God today, just obey, you never know… He always has good in mind. North Fork, California 2016 con’t. God continues to work in us and through us here. We have been blessed by wonderful fellowship with dear friends. Our children are enjoying seeing their friends again. Last week, Jeremiah joined his friends in a bible quiz in a nearby church. He said to me, ‘I prayed that God would help me do well.’ And He did, praise God! Samuel has been asked to join the worship team here the last few times. He plays their Jembe drum. Our older 4 children, joined their friends in leading worship at a women’s conference yesterday. Last Sunday, Pitana preached at the church here exhorting the brethren to give themselves to prayer and to pray without ceasing. On Friday, he ministered the Word in a small group. He shared some of the testimonies we have in the Lord, encouraging everyone to press in more in the Lord. There is just much more to the Lord. Let’s believe for greater… The previous small group, Pitana had shared on faith and patience challenging us all to look back to some situations we have given up believing God for. Pray and believe, remembering that ‘with God, nothing is impossible.’ This week we received testimonies of some of those difficult situations that was prayed for. Hallelujah. God is faithful. Thank you so much for your continued prayers. This week, we are praying and waiting for the presidential election results. Please take time to pray for America. God has been overwhelming us with His goodness and His desire to set people free. When God says, ‘who shall I send. It’s our family’s practice to reply, “here we are Lord, send us.” But we never know how that ‘yes’ will affect many lives for eternity. So humbling that the God of the universe would choose to work through us. This past week, we experienced God’s love for a young person as He exposed the struggles and thinking patterns that can lead to suicide. He also sent us to a Sunday afternoon fellowship where we shared testimonies on being led by the Holy Spirit and saw many set free and encouraged. They expressed their gratitude to us for driving all this way to come and serve them. We ministered in a Bible Study where Pitana shared the Word and imparted faith in all of us. We continue to have daily times of encouragement with brothers and sisters. Friday night, we had an all night prayer meeting introducing others to this precious practice we cherish so much. What awesome, indescribable things take place when we are in the presence of God! So today, if the Lord is speaking to you, just obey, you never know how your obedience affects others. It has been a busy but wonderful couple of months. We are on the road again. Currently across Southern US during the winter and God willing, across Canada in the Spring and Summer. What a journey it has been! Thank you to all who prayed with us for a travel trailer. The Lord miraculous provided. We will share about that beautiful testimony in another post. We have been on the road just over 2 weeks now and we are seeing God literally order our steps to places we have not been before; to people we have not known before and do amazing things in us and through us and in those He brings our way. Let me briefly share one of those God stories. We are now at a camp in the Sacramento, California, area. We have been here for a few days and had been wondering where we will go to church on Sunday. Then the Lord clearly spoke to us and said,”do not look for a church to attend , you hold a service here at the park, there are people I want to reach out to.” Ok Lord! He of course orcastrated it and we had worship time here at public camp grounds by the picnic area. One of our sons played the drum, joined by one of the campers who plays guitar and we lifted up our voices to the One who is WORTHY. After, Pitana shared the Word the Lord had laid on His heart and we concluded in prayer and fellowship. Wow, that is the God we serve! One of the ladies who attended said,”this was so good, we have been dry.” it had been over a month since they had been at church. God knew that of course and went out to reach out to all who came. All do not currently attend church. There is no boundaries God will not go past to reach His own who have been beat, bruised and left hanging dry, to reach. What a wonderful Shepherd we follow. Please continue to pray for us to keep hearing His Voice and follow, wherever He leads. Yea! more lives going deeper with Jesus! Thank you so much for your love and prayers. It has been a busy time for us but God’s grace is sufficient and with great joy we keep moving forward. On the 20th, we put on an African night event in Surrey BC. It was a good and beautiful night that included African music, food, culture, East African market, a play by our children, a gospel message, and sharing our heart for Africa along with our upcoming mission trips across Canada and then Africa. We were blessed to have a wonderful team of friends who helped with putting this event on. We were also blessed by all who came to support this work God has called us to. Thank you so much! The following Saturday, we were honored to baptize 7 people in Burlington, WA. It is always a joyous occasion to witness others take steps to go deeper with the Lord Jesus. The baptism was on our daughter, Elizah’s 4th birthday and a day before my 33rd birthday. We were surprised by a cake following the baptism. We have also been packing and we moved out of our rental place today ready to follow Jesus wherever He leads us. We will share more in days to come. To partner with us in this ministry e-mail us or click here to give. What a blessed time we had! Our first discipleship conference went well. Thank you all for your prayers. Those of you who were there, we enjoyed worshiping with you. The ALL NIGHT Friday session was incredible, with 28 people showing up! As soon as we arrived at the building, the lights went off ( in the city), but we were all determined to stay and see what God had in store for us that night. One of the sisters who had just come from a party, had lots of battery empowered candles, to which we lit and began to pray before starting the worship. All of the sudden, the lights came back on! Praise God! The worship was incredible. I cried and laughed as we soaked in the presence of God. How I needed to worship that night! How sweet and refreshing God’s presence was that night. I was so thankful that He had called this meeting just to give us this opportunity to be with Him. No place we would rather have been no no! All the sudden, one of the worship team members said, “I don’t know why but I hear ‘blood transfusion. '” I threw my hands in the air and by faith I said, “I receive it Lord.” With this current pregnancy, I had been a bit weak with low iron and had been praying and wondering how in the world I would be able to go through the whole conference later on do an all night meeting. But the Lord kept commanding me to go, and so I went. From that instance, I had so much strength. I was able to serve and minister the whole weekend and still look after my family. A total miracle for me. Praise God! He is so good! God worked a beautiful work in many who came. He ministered to families, and we witnessed families walking to the altar and dedicating their whole family to the Lord. Word of knowledge words were given (only God could have known) and prayer offered for those individuals. Don’t you love it, when God chooses to show you His love by telling someone who doesn’t know what is happening with you, to pray with you about that very situation? Even though it was superbowl Sunday, we had our last session and men, women and children showed up and we lingered around long after the conference was over. What sweet fellowship and food! Pitana taught on the 7 stages of discipleship showing the potential we have in Christ. From a brand new believer who was there to those who have walked with Jesus longer, we were all challenged to go deeper.